EDIT: Giveaway is officially over. Congratulations to Angelica Cassandra Dimeo for submitting the randomly-chosen 206th entry. Please check your email for instructions on how to claim your prize. April showers may bring you a White Rabbit necklace! 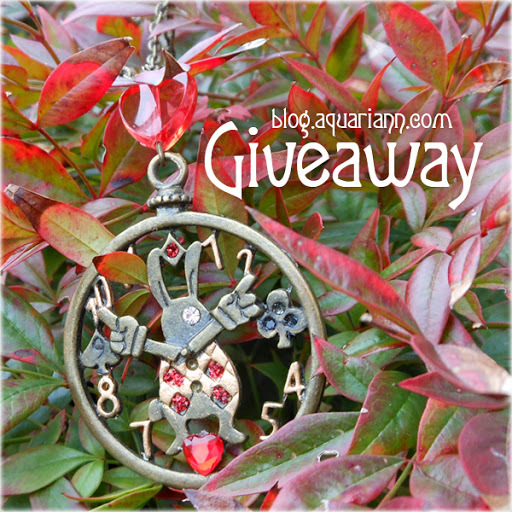 Follow me down the Rain Rain Go Away Giveaway Hop, where I picked a piece of my mom's handmade jewelry as the prize. She embellished a pocket watch charm with gold paint, rhinestones, red glitter and a heart-shaped bead. The 1.5" circular pendant is strung on a matching antique bronze tone chain that measures approximately 16 inches that closes with a lobster clasp. Don't cry a river like Alice because only one of my readers will win this one-of-a-kind necklace! If we get flooded with comments, mom will make more Alice in Wonderland jewelry to list in my Etsy shop. Now quick, don't be late for a very important date! 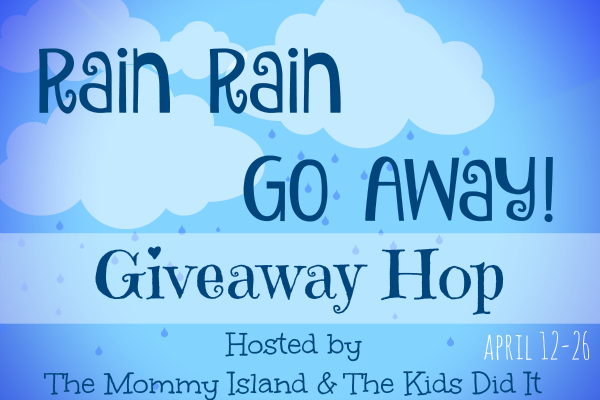 Grab your chances to win and then run to 100+ wonderful bloggers also giving away prizes in the Rain Rain Go Away Hop at the bottom of this post. Use the Rafflecopter below to enter to win worldwide giveaway before 11:59pm EST on April 26, 2016. Be sure to leave the mandatory comment on the blog post with the same name you use to fill out the Rafflecopter - all entries by winner must be easily verified or a new winner will be chosen. I saw this and it brought tears to my eyes, my childhood friend passed away unexpectedly just last year, Alice in Wonderland was her favorite movie, I got her a plush Cheshire cat not to long before, some of her friends are thinking of getting the Cheshire cat tattoo, but this would be nice for friends and family to have as a remembrance!!! Yes please make more items, please! I am so sorry to hear about your dear friend, Amber! *hugs and happy memory sparkles* I will tell mom to be on the lookout for some Cheshire cat charms. I really like the 4Pcs Alice in Wonderland Steampunk Antique Tibetan Jewelry Findings Mix Lot 93, these would keep it in time! I would chose the 7 Pcs Alice in Wonderland Steampunk Antique Bronze Brass Silver Tibetan 5ml Drink Me Bottle Vial Jewelry Findings Mix Lot 20. They're all so sweet. eendrizzi79 at gmail dot com. I'd use the steampunk tea pot beads! I love the 8 Pcs Alice in Wonderland Steampunk Antique Bronze Brass Silver Tibetan 5ml Drink Me Bottle Vial Jewelry Findings Mix Lot 70. It has all things I think of about alice in wonderland and they are very cute! I like the silver steampunk clock and the silver Alice rabbit holding the playing card. They'd look good together (not sure of sizes). I love keys charms of all types and these would be great! I really like the 8 Pcs Alice in Wonderland Steampunk Antique Bronze Brass Silver Tibetan 5ml Drink Me Bottle Vial Jewelry Findings set. The drink me bottle is so Alice in Wonderland to me. I like the 4 Pcs Alice in Wonderland Steampunk Antique Bronze Brass Tibetan Rabbit Jewelry Findings Mix Lot 59. Alice in Wonderland 10 Pcs Steampunk Antique 1ml Drink Me Bottle Vial Jewelry Charm Findings Mix Lot 98 has all the essentials...you do need a Drink Me bottle, key, teapots and cups to make the story happen. I really love all of the "drink me" potions bottles. My oldest love Alice in Wonderland and this would be something unique like her for her bday present. I love the 4 Pcs Alice in Wonderland Steampunk Antique Bronze Brass Tibetan Rabbit Jewelry Findings and chengxun 5pcs 42x43mm Antique Bronze Elegant Alice in Wonderland Wreath Charm Pendant c1667. I think she should use the Alice in Wonderland 10 Pcs Steampunk Antique 1ml Drink Me Bottle Vial Jewelry Charm Findings Mix Lot 100! Loving the cat sweater pendant on the chain, that and the steam punk. Super cool. I love these: http://www.amazon.com/Wonderland-Steampunk-Antique-Tibetan-Findings/dp/B00BITFFCA/ref=sr_1_5/176-4789082-4400765?s=arts-crafts&ie=UTF8&qid=1460928826&sr=1-5&keywords=alice+in+wonderland+beads What fun pieces! I like 5 pcs Alice in Wonderland Steampunk Antique Bronze Brass Silver Tibetan 5ml Drink Me Bottle Vial Jewelry Findings. I love the antique looking keys and the "drink me" part of the story has always been a creepy favorite. I love the drink me bottle charm. I like the Antique Bronze Brass Tibetan mix lot 94. I like the 4 Pcs Alice in Wonderland Steampunk Antique Bronze Brass Tibetan Jewelry. The 4Pcs Alice in Wonderland Steampunk Antique Tibetan Jewelry Findings Mix Lot 93 is exquisite and certain to start conversation for anyone wearing it. I like the 10 Pcs Steampunk Antique silver Tibetan Jewelry Findings Mix Lot 105. I love the Vintage Alice in Wonderland Cat Mouse Cat sweater chain necklace! I love ALice in Wonderland!!! The necklace is so nice!! I really like the 5 x Antique Silver Tibetan 36mm Pendant (Alice In Wonderland Rabbit). These would look awesome too! I really like the Silver Plated With Enamel Black Spades Playing Card Suit Charm and the 5 x Antique Silver Tibetan 36mm Pendant (Alice In Wonderland Rabbit) is adorable. I like the Alice in Wonderland Steampunk Antique Bronze Brass Tibetan Rabbit Jewelry. I think the Antique Bronze Brass Tibetan Silver Jewelry Findings Mix Lot 1 would look good. The tea party is my favorite part of the movie. my favorite is the Antiqued Silver Plated Steampunk Clock Pendant 26mm . it is beautiful! I love the 7 Pcs Alice in Wonderland Steampunk Antique Bronze Brass Silver Tibetan 5ml Drink Me Bottle Vial Jewelry Findings Mix Lot 20. I like Alice in Wonderland 10 Pcs Steampunk Antique 1ml Drink Me Bottle Vial Jewelry Charm Findings Mix Lot 100. I love the 4 Pcs Alice in Wonderland Steampunk Antique Bronze Brass Tibetan Jewelry Findings Mix Lot 94.
steampunk teapot beads would make awesome jewelry. I like the Steampunk Antique Tibetan Findings. 100 Pcs Steampunk Antique Bronze Brass Key Charm & Pendant Tibetan Style Jewelry Findings 6x2cm Lot 44. I like the chengxun 5pcs 42x43mm Antique Bronze Elegant Alice in Wonderland Wreath Charm Pendant c1667. I love love love all the mini antique bottle findings! Super cute! The Rabbit Choker would be great. I love the Silver Plated With Enamel Black Spades Playing Card Suit Charm - this would be a great addition to any piece of jewelry. I love the Antique Bronze Elegant Alice in Wonderland Wreath Charm Pendant.